1.The arboretum is located on the University of Virginia’s Blandy Experimental Farm — but it’s nowhere near Charlottesville. It’s in Boyce, Va., 10 miles east of Winchester, and 73 miles from Fairlington Community Center via I-66 and US 17 N. Created in the 1930s, the 172-acre arboretum is home to more than 5,000 woody trees and shrubs from around the world. 2. Not just the location is surprising. So is the history. In 1926, Graham E. Blandy, a New York stockbroker and railroad tycoon, left 700 acres of his 900-acre estate in the northern Shenandoah Valley, including orchards and grazing lands, to UVa, with instructions that it be called Blandy Experimental Farm and used to “teach boys how to farm.” One problem: UVa had no agricultural studies or research programs. After some controversy, the university appointed a committee (of course) to visit the property and figure out how to meet the terms of the bequest. Research projects in biology followed when Orland E. White, a noted plant geneticist at Brooklyn Botanic Garden, was named the farm’s first director. In his first correspondence with UVa, White mentioned starting an arboretum at Blandy to promote “local interest and pride, and eventually…nation-wide interest.” He gathered plants from around the world. 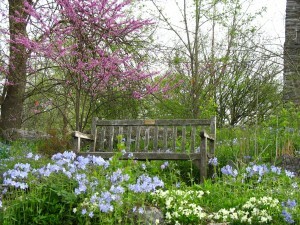 The arboretum is also called the Orland E. White Arboretum. 3. What you can see: one-third of the world’s pine species, a grove of more than 300 ginkgo trees – gorgeous in October, the American Boxwood Society’s Memorial Garden with 162 kinds of boxwoods, a Native Plant Trail and an Herb Garden. The conifer collection includes 1,300 specimens from North America and around the world. The American Boxwood Society was founded at Blandy in 1961 to support boxwood research at Virginia Tech. A group of gardeners was concerned about the decline of the boxwood in Virginia. The Virginia Native Plant Society is also based at Blandy. 4. What you won’t see: The “radiation pit.” In 1955, during the “Atoms for Peace” era, researchers sponsored by the Atomic Energy Commission established a Cobalt-60 source in a building at Blandy and exposed plants from the farm and arboretum to radiation in hopes of creating greater resistance and higher crop yields. A headline in the Washington Post: “Scientists Bombard Chestnut Seeds with A-Energy to Rid Trees of Blight.” The research at Blandy, one of only two sites in the country doing such work, was stopped in 1968. 5. The price is right and dogs are welcome. Admission is free, and the grounds are open from dawn to dusk 365 days a year. 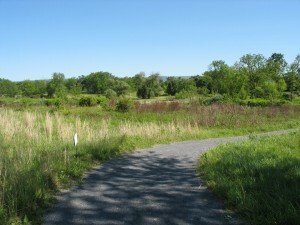 Blandy Farm has many walking trails and paths. 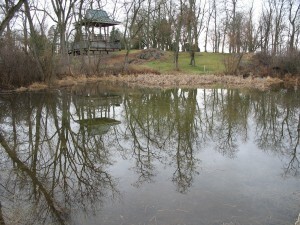 Walks, photo workshops and other educational programs take place year around. 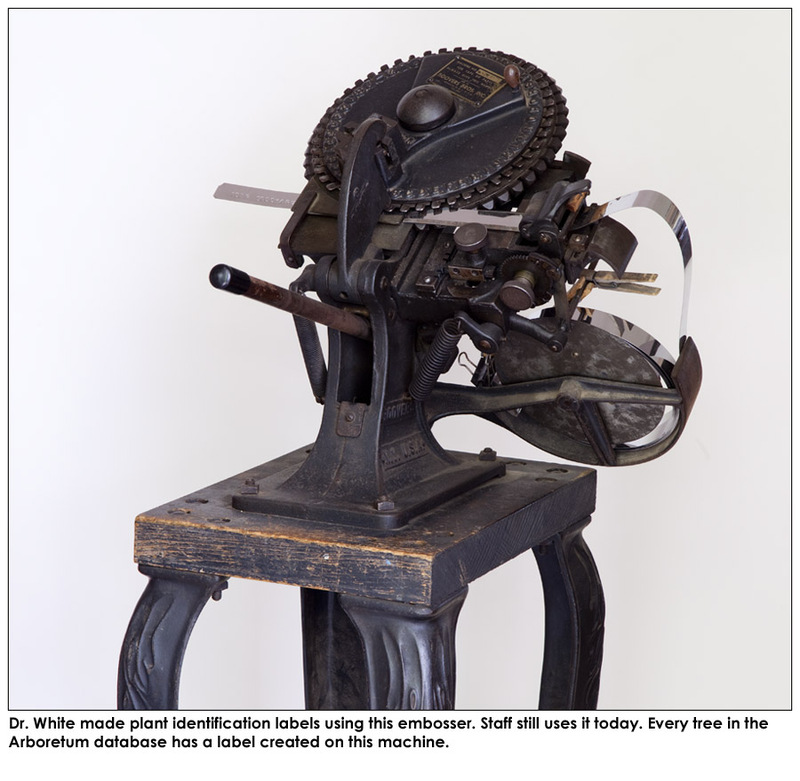 BONUS: White designed a tree identification label-maker that looks like a Rube Goldberg contraption but is still in use today. Questions? Contact Blandy Experimental Farm at 540-837-1758. The office is open 9 a.m. to 5 p.m. weekdays. This entry was posted in Five Things You Didn't Know About..., MG in the Garden and tagged Arboretum, MGNV, University of Virginia. Bookmark the permalink.